The perfection of this cover isn’t evident until you read the book. Perfection! Verdict: An exhilarating mix of action, fantasy, technology, philosophy, love, politics, religion, metaphysics, and semiotics. Oh and also: genies. Perfect for: On the back cover there are blurbs describing this book as “a multicultural Harry Potter for the digital age” and “A Golden Compass for the Arab Spring”. I feel like these comparisons are not particularly accurate, other than the fact that I think they are trying to get across that Alif is the kind of fantasy book that is rooted in the world we live in now and that wants to explore some serious issues all while providing the reader a riotous adventure. I also think these comparisons speak to the fact that both adults and teens can enjoy this book on many different levels. Summary: [Disclaimer: I started reading this book without knowing anything about it, and it was really cool figuring out what was going on. Souk al Medina was close to the wharf, giving vendors easy access to the fishing boats that came in at dawn and sunset. It was as ancient as the Old Quarter, active since the days the City was only a punctuation mark on the Silk Road, a resting place for merchants and pilgrims on their way to Mecca. Alif had known it since childhood. He remembered clutching the end of his mother’s shawl as she bought live chickens and fish heads for stock, or raw spices measured by the gram. [Alif] wandered down alleys that had never been paved. The footing was half mud and reeked of yeasty animal functions. Every so often the alleys were interrupted by limestone arches, the remnants of a covered market hall long since quarried for newer buildings. The place was impervious to its own history…Alif pushed his way toward the wharf, past fishmongers extolling the freshness of their wares in rhyme. Over the sea of covered heads he saw a tiny storefront with a sign advertising mobile phone sales and repairs, and moved towards it. With relief, he spotted a familiar figure – Raj, an enterprising Bengali who had unlocked Alif’s own smartphone – leaning in the doorway. “Raj bhai!” Alif tilted his chin up in what he hoped was a jaunty manner….”Come inside. Chai?” He said that last word in a Bengali drawl that verged on sarcasm. I have no idea how a Bengali drawl can sound sarcastic, but I think that’s the point. Wilson transported me into another world that feels disorienting in the best way that fiction can make you feel. Wilson also has a knack for making the mundane feel fantastical – after a sandstorm, the City’s modern glass skyscrapers are covered in a fine glittering dusting of sand, like an “ancient jinn city”. Before writing this novel, Wilson was a comic book artist and you can see her ability to conjur up striking visuals all through the book. In addition to creating the complex and sometimes fantastical world of the modern day emirate city state, Wilson also creates a legit, parallel fantasy world of the [SPOILERS]: jinn, or genies. Just as Harry Potter learns that Platform 9 3/4 is the secret entrance to the Hogwarts express, Alif eventually discovers both a secret entrance to a jinn marketplace down an alley that shifts geographical location as well as the jinn lands of the Empty Quarter deep in the desert. With the jinn taking on many fantastical forms and having their own different quirks of customs, there definitely are echoes of Harry Potter’s Diagon Alley or even the various bars of Star Wars or Star Trek. 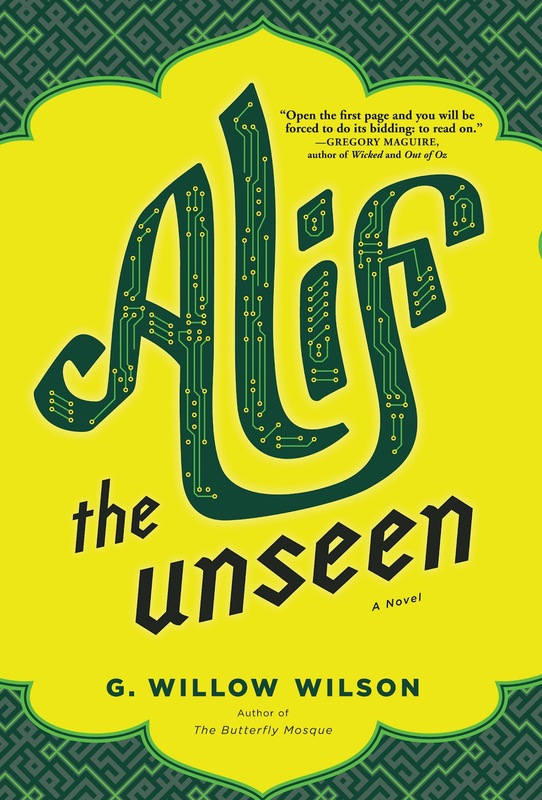 All fantasy books have their protagonists locked in a battle of good vs. evil, but in Alif the Unseen, the evil is so very very real: the State government that imprisons and tortures its dissidents in windowless prisons in the desert. The fact that these kind of oppressive regimes and secret prisons exist in real life makes Alif’s peril seem even more terrifying than anything that Azkaban could ever conjure up. Alif is not only trying to save himself but also the freedoms of regular citizens, and given the events of the Arab Spring, a happy ending to the story would mean so much more than a triumphant protagonist in a Hero’s Journey. This book deftly weaves in politics and religion and symbolism into the story in multifaceted ways. For example, there are characters that are deeply religious to deeply indifferent to religion, but all of their perspectives are given. The idea of the regular people of the City rising up in revolution against the State is shown to be as full of problems as it is full of promise. And there is an ongoing debate about the power of stories and the relationship of fiction to truth. The theme of what is seen and unseen also runs through the book in many different ways. This is heady stuff but really fun to think about. If you’re not into thinking about serious stuff, read this book for the adventure. I am notorious for tuning out fight scenes and car chases when I watch movies because they all seem the same and are so boring. But I was riveted by the many chase and fight scenes in Alif, and after the first fifty pages, the action and plot move along briskly. There is also a great sense of humor throughout, such as when Alif and a Muslim leader get into a debate about whether it is permissible for someone’s avatar in a video game to eat virtual pork, or that it is rumored that genies love abandoned human cities and most especially Detroit. Romance is also a part of the story: after all it is Alif’s love predicament that kicks off the whole plot. Love shows up in unexpected ways between unexpected characters in satisfying ways. In fact, “unexpected and satisfying” is a great way to describe this wonderful novel. Without saying too much, LitHacker will always award bonus hearts to any book that successfully incorporates cats into its plotline. Yay cats! -Alif reads just a few stories from The Thousand and One Days, the book purported to have been written by genies. I only wish I could read the whole book. The few stories we get to read are clever fairy tales filled with humor and meaning. -The examination of sexual politics in Arab/Islamic lands. I liked that the various heroines in the story wear everything from a loose head scarf to a full veil. – I loved the genie Vikram. He reminded me of the Master in Master and Margarita. This entry was posted in Adult Fiction for YA, Full Hack, No Hacking Needed <3 and tagged Cover love, Funny!, Future movie, Male narrator, Not set in the USA, Spirituality by lithacker. Bookmark the permalink. I took your advice and didn’t read your review…I just added it to my amazon.com wish list instead!